You can create additional aliases for use with any domains in your Shared Hosting account. First, ensure you are logged into your account at http://hosting.xmission.com. 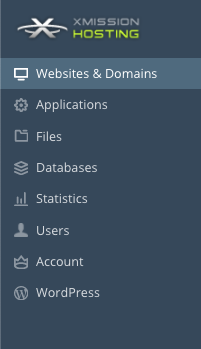 From the Control Panel, click on the "Websites & Domains" tab near the top of the screen. Near the bottom of the screen, click the "Add New Domain Alias" button. On this screen, you will need to complete the following information. A brief description of each follows the image. Domain alias name: This is the name of the domain that will be aliased to your existing site. In this example, we would be adding "xdesign.org" which would alias to "xdesign.com"
Synchronize DNS zone with the primary domain: As this is an alias, you will likely want this checked so any DNS changes (e.g. subdomains) made to your primary domain work with your new domain alias. Mail service: Check this box if you would like your domain alias to redirect emails to your actual domain. For example, if this box is checked, someone could email "example@xdesign.org" and it would be delivered to the account "example@xdesign.com"
Web service: Check this box if you would like the web content from your primary domain to be visible at the new domain alias. 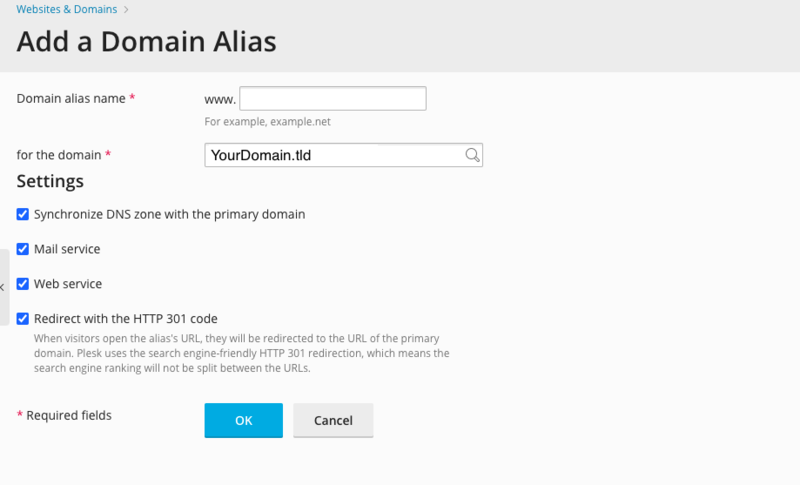 Redirect with HTTP 301: When visitors open the alias's URL, they will be redirected to the URL of the primary domain. Panel uses the search engine friendly HTTP 301 redirection, which means the search engine ranking will not be split between the URLs. Java web applications: If your primary domain utilizes any Java applications and you want these to be available at the domain alias as well, check this box. Once you've entered the correct information for your new domain, simply click "OK." You will see the following text indicating your new domain alias has been created successfully! Password Protecting a Directory With ".htaccess"
This page was last modified on 11 August 2016, at 10:42.